We have a favor to ask…If you plan on coming to the meeting below please take the time to send an RSVP to nwwbviv@gmail.com letting us know. It’s not required but will help us set up the room comfortably. On Monday the 19th (President’s Day) we bring you a group of gals who are doing just that. 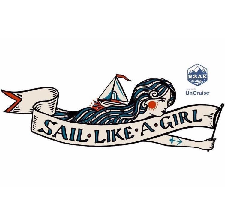 You’ll be inspired by gals from this intrepid 9-women team – Sail Like A Girl who are taking on the Inside Passage under sail. Make the time to come and share an evening with this group of gals who have committed to the 2018 Race To Alaska, aka the R2AK. Are you intrigued by the Inside Passage? They are doing it on a Melges 32 using no engine or support! Learn about how they are planning for the race, their boat, the race itself…what a way to take on the Inside Passage! Learn about this unique no motor, no support race, from Port Townsend to Ketchikan. The R2AK site says “It’s like the Iditarod, on a boat, with a chance of drowning, being run down by a freighter, or eaten by a grizzly bear. There are squalls, killer whales, tidal currents that run upwards of 20 miles an hour, and some of the most beautiful scenery on earth.” All manner of human-powered craft can participate. … because I love to be challenged by difficult sailing. … for the sake of my own sanity. It is something that has gotten under my skin from the moment of inception and will drive me crazy not to do it. …because I can’t stop thinking about it. R2AK has been calling my name since the beginning and it is something I have to do. Now is the time and this is the crew to face that challenge. I would also like to see a bear. …because I’m ready for a new challenge. Something bigger than myself. R2AK represents just that. My drive, determination and desire to constantly grow will not let me say not to this adventure. …(it) combines my love for the sea with my passion for adventure, my dedication to pushing further and my commitment to showing what strong women are capable of achieving. …When life opens a door you have the choice to take a risk and walk through, or to turn away. I’ve found in life the most memorable times have been when I have taken the risk and opened my mind to new possibilities. …Many women never come to know their physical potential, only their limitations. Leading by example and pushing my boundaries drives me. …When an opportunity arose to take a break from daily life to join a group of amazing women racing through some of the most beautiful territory on earth – I couldn’t say no. The Salish Sea calls to me…and while this race will likely be long and at times uncomfortable, I know it will be full of adventures, perspective and challenges.